Typhoon is a result of a programme to satisfy both German and UK Air Force requirements. In July 1979, air staff from UK, Germany and Italy initiated European Combat Fighter study. In April 1982, preliminary design of ACA (Agile Combat Aircraft) was known, though it had twin tail and cranked delta wing. In December 1983, France and Spain joined up, after which requirements for new 9,5 ton, twin-engined, single-seat, delta-canard fighter were outlined. Other requirements were good maintainability and reliability, single seat, short turn-around time, low life-cycle costs, 6 000 hours life time, range of 550 kilometers and ability to take off and land on short runways. Radar was developed by Euroradar consortium. But there were points of divergence: whereas Luftwaffe preferred weight of 8,5 tons, AdlA preferred 9-ton aircraft and RAF wanted 11-ton one. As a result, upper and lower weight were agreed upon. Soon, Dassault obtained contract to design a fighter with empty weight of 9,25 tons, whereas rest of consortium (BAe, MBB, Aeritalia and CASA) focused on aircraft with empty weight of 9,75 tons. By February 1985, both designs were presented, yet neither fulfilled European Staff Target requirements. Reason for diverging ideas about weight were different requirements: France wanted export-friendly multirole aircraft, whereas Britain wanted longer-ranged aircraft, capable of reaching Central European battlefield from British Islands, as well as utilizing British engines. Further, it proved impossible to reach an agreement on who will exactly lead the project. In August 1985, France decided to pursue its own programme after being denied lead in programme, and being only nation with requirement for a carrier capable aircraft. 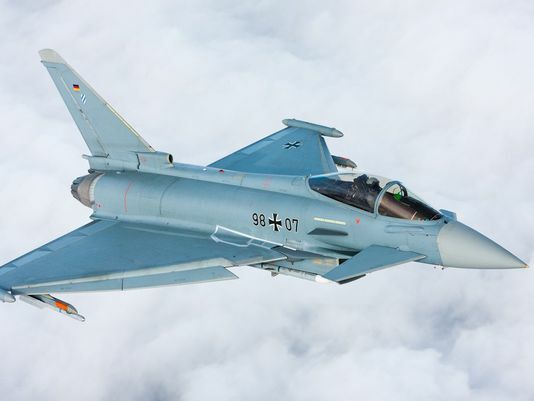 In 1986, weapons systems companies that were taking part in the project formed joint management company Eurofighter GmbH, and engine companies formed Eurojet GmbH. In 1987, Chiefs of Staff of Air Forces of four countries developing fighter signed European Staff Requirement for Development (ERS-D) of the European Fighter Aircraft (EFA). Aircraft was to be optimised for air-to-air combat in both BVR and WVR regimes, with capability to perform Air Defence, Air Superiority, Offensive Counter Air, Air Interdiction, Offensive Air Support, Maritime Attack and Reconnaissance. Engine designs were developed by Rolls-Royce and Snecma, both designs optimized for aircraft proposals of their respective countries. This paid off when France left the project to develop carrier-capable Rafale, utilizing Snecma’s engines. Development of EFA continued with original focus on air-to-air missions. Production contracts were awarded as following: 33% to each Germany and UK, 21% to Italy and 13% to Spain. This corresponded to number of aircraft that were to be procured; out of total of 760 aircraft, UK and Germany each were to purchase 250, Italy was to purchase 160 aircraft and Spain 100. In 1992, in light of changed political situation, review of the project was undertaken. Requirement document was completely reconfirmed, whereas industry stated that baseline Eurofighter is still the most cost-effective solution. In view of reduced threat, however, number of aircraft was reduced from 720 to 602. Technical problems made it impossible to adhere to original timetable: first flight of a prototype, planned for 1991, took place in April 1994. In February 1992, Spain announced that it will only buy 87 instead of 100 aircraft, and Germany reduced its purchase to 140. Due to German reluctance, Eurofighter consortium undertook study on how to reduce Eurofighter’s unit price. This study was delivered to governments in October, after which UK signalled intention to continue with original programme, alone of needed, and suggested triliteral continuation of programme to Italy and Spain, after which Germany too decided to continue with project. Large part in force reductions was played by budget cuts following fall of Soviet Union. In December 1993, governments agreed to continue the project, although with changes to overall configuration of the aircraft; consequently, project was renamed “Eurofighter 2000”. In April 1995, memorandum on dividing costs incurred due to redevelopment was signed. Project was especially important for UK and Spain, which – unlike other countries – used project to develop military technology, contrary to current trend that military adapts technologies developed for civilian purposes. In 2002, Austria became a procurement partner in programme, and first aircraft were delivered to Germany and Spain in 2003, with Italy receiveing first Typhoon in 2005. In 2007, multi-role Typhoons were delivered to the UK and Austria. In 2006, Saudi Arabia selected Typhoon, though only after forcing UK to cease investigation of bribery in Al Yamamah weapons deal between UK and Saudi Arabia. First Saudi Typhoon was delivered in 2009. Airframe is made with generous use of composites, titanium and aluminiom-lithium alloys (over 70%) in order to reduce weight. Side-effect of that is that it is more resistant to corrosion, and thus easier to maintain in humid environments. However, Typhoon is not suitable for the carrier aircraft due to the canard placement as well as structural reinforcements that would have to be done in order for airframe to withstand stresses of carrier operations. Use of composites, as well as general shape, results in reduced frontal RCS. Aircraft also uses structural health monitoring and automatic equipment failure detection equipment. Typhoon’s canards (canard, fr. = duck) are very large and placed up front so as to minimze interaction with the wing; in essence, canards are performing the same function as tail does in tailed aircraft. Position results in minimal induced and trim drag, as well as minimal interaction with air intakes, which are mounted under fuselage to maximise air flow at high angles of attack, and is well suited for long-range supersonic aircraft. While close-coupled canard typically results in increased lift at higher angles of attack, effect is irrelevant at supersonic speeds. Eurofighter also stated that Typhoon’s high level of instability resulted in lift advantage due to close coupled canards being minor. As a control surface, long-arm canard is far more effective than either tail or close-coupled canard of similar size, as it offers faster control response due to longer moment arm, and if stall angle of canard is lower than that of the wing, aircraft is effectively stall-proof. As all positions other than low-and-forward and high-and-aft have been deemed aerodynamic disasters, low-position long-arm canard was eventually chosen. Compared to tailed delta configuration, Typhoon’s configuration has the advantage of larger wing area (made possible by not using the horizontal tail surfaces) as well as the fact that canard actually adds lift during the turn, while tail detracts from the total lift. However, there is no interaction between canard and the wing, and as such wing has to rely solely on lift provided by vortices created by the wing itself during the high-alpha maneuvers. Leading-edge slats are used to improve aerodynamic wing lift during maneuvers. Canards are also more effective than the tail due to the longer moment arm they offer, thus requiring less force to achieve the same effect. At supersonic flight, chosen configuration has additional benefit compared to tailed delta: as it suffers smaller aerodynamic centre shift with Mach number, it has reduced trim drag, and there is no adverse tailplane/afterbody pressure drag interference. However, canards are inefficient as a roll control device, so wing has to be stiffer than in tailed delta configuration. Wings are positioned low on the body, and are of normal delta shape with 53 degree sweep, cropped tips, offering large wing area and volume at light weight. This shape also causes creation of vortices even at relatively low angles of attack, increasing the avaliable lift beyond one caused by normal aerodynamic flow; as a result, stall angle of delta wing is higher than usual even without high-lift devices. Size of vortices increases with angle of attack. However, addition of LERX (for which there is enough space between wing leading edge and front end of intakes) would strenghten these vortices and cause a major improvement in Typhoon’s already good turn performance. Another importance of delta wing is in its dynamic vortex burst behavior; namely, a delta wing that is pitching up will produce vortex burst that lags behind when compared to wortex burst for same angle of attack under static conditions; result is higher instanteneous turn rate for delta wing. Amount of lag also increases as speed of pitch-up increases; result is that pitch-up condition creates major increase in lift compared to static condition. High drag, however, means that delta wing has lower lift-to-drag ratio than regular wings unless paired with high-lift devices such as close-coupled canards which increase lift for most given AoAs, but are absent from Typhoon. Wings also have high-lift devices in form of leading edge slats; these can be deployed to increase lift during takeoff and landing, and also during combat to prevent air flow separation at moderate angles of attack, though latter is not always done because of large increase in drag it causes. When deployed during maneuvers, they also improve directional stability. As tips are cropped, tip drag is lowered at high angles of attack. Large wing reduces aerodynamic effects of heavy external weapons stores, but also limits effectiveness of trailling-edge control surfaces. Additional effect is increased effectiveness of control surfaces as dynamic pressure increases, whereas in tailed aircraft, effectiveness is reduced with increase in dynamic pressure. Wings are also elastic, able to twist during maneuvers in order to prevent tip stall. However, fact that some control surfaces are at rear end of the wing limits their effectiveness at supersonic speeds, and delta wing itself restricts supersonic maneuverability by making aircraft stable. This in turn means that aft control surfaces no longer help the lift, as they do in unstable aircraft, but reduce the effective lift. Low position of the wing results in better takeoff performance, better view from the cockpit, less induced drag, and less lateral stability compared to high position. Compared to mid position, however, it has more interference drag. It also results in 3-8 degrees of effective dihedral even before any actual anhedral/dihedral of the wing is considered. Low wing loading and large amount of vortex lift result in good instantenenous and sustained turn rates, shorter takeoff distance, but also in bad low-altitude performance, making it obvious that aircraft is designed as air superiority platform. Both wings and canards are swept back and sized so as not to enter shock wave cone. On both sides of the fuselage, Typhoon has vortice generators, used to create fuselage lift at high AoA. Intakes are two-dimensional and placed under the hull, in a fashion similar to the F-16. That arrangement has the advantage of fuselage serving as the air flow straightener, improving air flow into the engine during high-alpha maneuvers and thus preventing loss of thrust. Intakes are also distanced from the fuselage, preventing ingestion of turbulent, low-energy boundary layer air, which would reduce engine efficiency. Due to their position however, they are subject to magnified side-slip effects. Intakes have lips which are used to affect flow of the air into them, additionally improving intake of air at high angles of attack, as well as adjusting amount of air influx depending on the current speed, thus ensuring optimum engine performance over very wide flight envelope. These lips, however, add to the mechanical complexity. Air ducts themselves are curved, which serves dual purpose of reducing frontal RCS, as well as causing a series of shock waves to slow down air flow to subsonic speeds during supersonic flight – that slowdown being a requirement for engine operation at supersonic speeds. Additional shock is caused by diverter plate above intakes. As intakes are designed for a supersonic performance, sidewalls and lip tips are not sufficiently blunt to significantly delay air flow separation; as a result, air flow losses increase sharply after passing 30 degrees of alpha. At 70 degrees, losses can be as high as 20%. Design of cockpit and fuselage in general provides a very good visibility for the pilot, even to the rear. However, nose shape and large canards placed up-front mean that lookdown capability is somewhat limited, thus making carrier variant of the aircraft unlikely. There are four semi-conformal stations for BVR missiles on the fuselage; however, there are no wingtip stations for WVR missiles, as wing tips are taken up by defensive aids subsystems. There is total of 12 weapons stations capable of carrying missiles, with centerline station being used for fuel tank. While an all-moving fin was considered, standard fin was chosen to save weight despite the reduction in the control power. As aircraft bank, using lift from wings and not tail input for turning, reduction in control power of the fin is mostly inconsequential for dogfight. However, fin is still important for supersonic maneuvering; as a result, it is very large. Too large vertical fin can result in problems if roll is experienced, causing aircraft to enter sideslip in direction of the roll, and start spiralling to the ground; too small fin can result in Dutch roll, which while not inherently dangerous does result in reduced performance. Typhoon’s fin is sized for directional control at Mach 2. Engines are Eurojet EJ-200 turbofan engines, and were specifically designed for high thrust and fast reactions. They allow aircraft to reach top speed of Mach 2, and also allow for supercruise of Mach 1,4 when clean, or Mach 1,2 in air-to-air configuration. Combination of strong engine, low wing loading and long arm canards means that Typhoon is able to take off with 700 meter runway. Each engine produces 60 kN of dry thrust and 90 kN of thrust in afterburner at peacetime setting, with wartime setting being 69 kN dry and 95 kN in afterburner. Specific fuel consumption is 21-23 g/kNs in dry thrust and 47-49 g/kNs in afterburner. As Typhoon has 4 500 kg of fuel, this allows for 8,5 minutes of afterburning thrust. Typhoon uses tricycle landing gear, with two wheels aft and one forward, which results in stress due to landing being better distributed. Canopy is of bubble shape with bow frame. While bow frame does limit forward visibility, it leaves rear hemisphere completely unobstructed. This shape allows for very good visibility from cockpit, which is crucial for dogfight. Most useful sensor for detecting enemy aircraft in combat environment is definetly IRST. As IRST is passive, it cannot be jammed or detected by the opponent, providing unparalelled tactical advantage. Image from IRST can be overlayed on both HMS and HUD. Typhoon’s PIRATE IRST can detect subsonic fighter aircraft, head-on, from distance of at least 90 kilometers, and at least 145 kilometers from the rear. Identification can be done at 40 kilometers, which is slightly beyond visual range. (All values are, however, for optimal conditions). In terms of mission profiles, it is able to perform target acquisition and identification, as well as allow for low level night flight. Current Typhoon’s radar is a mechanically scanned pulse doppler radar. Developed as ECR-90, and renamed into CAPTOR, it operates in X band, and weights 193 kilograms. Operating modes are long range air-to-air (BVR), close range visual (WVR) and air-to-surface. It has track while scan ability, and can be slaved directly to HMD. Detection range against 5 m2 targets is over 160 kilometers. Defensive system – DASS/Praetorian – is housed internally. It allows fully autimatized prioritisation of threats as well as response to said threats, with manual override being avaliable. It has electronic support measures, radar warner, laser warner, active missile approach warner, DRFM jammer, two towed decoys, chaff, flares. Jamming pod and towed decoy are housed on the wing tips. Radar and laser warner allow passive Typhoon to detect active fighter from longer distance than active aircraft can detect it, and as such provide a large situation awareness advantage. Missile Approach Warner gives 360*360 degree situational awareness. Typhoon’s gun is Mauser BK-27, a 27-milimeter gas operated revolver cannon developed in late 1960s for Panavia Tornado. It fires 27×114 mm high explosive shells at 1700 rounds per minute. Standard loadout of 150 shells allows for 5,3 seconds of continuous firing. Being a revolver cannon, it reaches full rate of fire in around 0,05 seconds, compared to 0,5 seconds for a typical Gattling design. Relatively heavy 260 g shell is also very destructive, an important aspect due to high structural strength of modern fighter aircraft. Impact fuse operates to 85 degrees of impact angle. Typhoon’s primary WVR missiles are IRIS-T and AIM-132 ASRAAM. IRIS-T is short-range IR missile equipped with thrust vectoring. It is capable of engaging targets at any angle around aircraft, even those that are directly behind, due to its lock on after launch capability; lock-on before launch capability is also present. Fuze is radar proximity based, and seeker is roll-pitch infrared imaging seeker with 128*128 resolution and +-90* look angle for high-off-boresight engagement capability. Using imaging technology makes it resistant to flares (but not to jamming). Target can be designated by either radar or pilots’ helmet mounted sight, and IRIS-T offers 360 degree defense capability. Maximum intercept range is 25 kilometers, speed is Mach 3 and it can pull 60 g turns. Missile is propelled by a solid propellant motor. Aside from already described, IRIS-T has one ace up the sleeve; namely, ability to destroy incoming missiles, both air-to-air and surface-to-air ones. While this is definetly not a foolproof system, and it is impossible to predict how well it will work, if it does work it can reduce number of BVR missiles aircraft has to contend with, but also most likely force pilot to engage enemy with gun. Development of IRIS-T started after Cold War, when evaluation of systems in MiG-29 revealed multiple aspects in which Russian AA-11 was superior to US Sidewinder, then in use in Luftwaffe. At the same time, extensive air combat simulations showed that far more targets will enter short range of 500 to 5000 meters than previously assumed. IRIS-T concept was presented in 1995, and development started in 1996 under German leadership. Germany also absorbed 45% of total development costs of 300 million Euros, or 135 million Euros. Partner nations were Germany, Greece, Italy, Norway, Canada and Spain, with Diehl BGT Defence assuming overall responsibility. Missile entered service in December 2005. During testing, IRIS-T achieved a direct hit against target with infrared countermeasures; I have not found data about nature of countermeasures in question. AIM-132 ASRAAM is, when compared to IRIS-T, longer-ranged but less agile, being able to pull 50 g turns, reach range of 50 kilometers and speed of Mach 3. Minimum range is 300 meters. Development of ASRAAM started in 1980s as a joint project between UK and Germany. Unlike with IRIS-T, ASRAAM was not intended as a highly maneuverable missile, as its main purpose was to bridge gap between AIM-120 and Sidewinder. As such, ASRAAM did not use thrust vectoring technology, putting emphasis instead on high velocity and increased range. In 1990, however, reunification of Germany gave a Luftwaffe look at Russian short-ranged Vympel R-73. It proved to be more dangerous missile than previously anticipated, outperforming Western IR missiles by wide margin in every category save for range. Germany consequently (and correctly) decided that AIM-132 performance is lacking, and decided to develop IRIS-T.
After that, UK looked for a new seeker, selecting Hughes infrared imaging seeker, same one as used in AIM-9X. Seeker has high off-boresight capability of +-90 degrees and lock on after launch capability. Typhoon’s primary BVR missile is MBDA Meteor, which is not yet in service. It is able to reach range of over 100/150 kilometers and speed of over Mach 4. It can be guided by its launch platform, another fighter aircraft or even AEW&C platform. Two intakes at each side of lower body are designed to reduce missile’s radar cross section. However, these may limit missile’s maneuvering capability. Aside from these, Typhoon is capable of carrying US-designed AIM-9X WVRAAM and AIM-120 BVRAAM. AIM-9X Sidewinder has minimum range of under 1 kilometers and maximum range of 35,4 kilometers. It is capable of reaching Mach 4, and can pull maximum of 50 g. AIM-120D AMRAAM has minimum range of 900 meters, maximum range of 110/160 kilometers and speed of Mach 4; however, Typhoon is more likely to use AIM-120C-5 which has same speed but maximum range of 75/105 kilometers. It should be noted that ranges given are maximum ones in ideal position: at high altitude, with enemy aircraft coming head on. At low altitude, range is 1/5 of that at high altitude, and range against aircraft in flight is 1/4 of that against aircraft in attack. Also, while it can be safely assumed that IR missiles can be released at 9 g turns, such limits are not so clear for BVR missiles. Typhoon is capable of using variety of air-to-ground weapons, ranging from bombs to cruise missiles. Precision weapons are laser-guided Paveway bomb, GPS guided JDAM bomb, Storm Shadow cruise missile, Taurus cruise missile, ALARM anti-radiation missile, HARM anti-radiation missile, Brimstone anti-armor missile, BL-755 cluster bomb, Harpoon anti-ship missile, and Penguin anti-ship missile; in future it could use DWS-39 cluster submunitions dispenser missile. Paveway “bomb” is actually entire series of guidance kits for GBU bombs developed in the United States, and Paveway bombs are actually already existing weapons fitted with Paveway guidance kits. Bombs weight 113, 227, 454 and 907 kilograms, and are used for attacks on both soft and hard targets. Similarly, JDAM is GPS guidance kit for bombs of 924, 959 and 459 kg. JDAM kit costs 20 000 USD, and consists of aerodynamic control and stability surfaces, as well as onboard computer attacked to the Inertial Measurement Unit; IMU is updated regularly through GPS. Once the bomb is launches, it takes around 30 seconds for GPS to get a fix on its exact location. First test drop of Paveway occured in 1965, and was first used operationally over Vietnam in 1968, where it achieved successes. In 1972, Paveway II follow-up program started. Paveway kit had bang-bang guidance system, which means that control surfaces are either fully deflected or not at all; this was finally upgraded in Paveway III, which also enabled attacks from low altitude. Paveway bombs come in general purpose, demolition and cluster variants. Storm Shadow is fire-and-forget air-launched cruise missile. It has reduced RCS and range of 250-400 kilometers, flying at Mach 0,8. Missile weights 1300 kg with 450 kg BROACH warhead that consists of penetrating charge, used to clear soil, and a delayed-fuze main warhead. It is fire-and-forget missile, and once launched, is fully autonomous. Attack on target is done in “climb then dive” pattern to achieve best penetration. Missile is optimized for pre-planned attacks on static targets, and uses passive imaging infrared sensor with autonomous target recognition capability. At terminal phase of flight missile climbs, ejects the ballistic cap allowing its IR seeker to acquire the target, and descends towards target, constantly redefining the aim point. If attack is aborted, or target cannot be acquired/identified, missile flies to a predetermined crash site. Taurus KEPD 350 is air-launched cruise missile developed in partnership between LFK and Saab Bofors Dynamics. It can reach over 500 kilometers at maximum speed of Mach 0,8-0,9. Double 500 kg warhead, called Mephisto, consists of precharge and initial penetrating charge to clear soil and enter a bunker, and a main warhead with variable delay fuze. Missile can be used for attacks against static targets and ships, and includes self-defense countermeasures. Flight path is programmed before use by mission planners, based on data on enemy air defenses. Missile is typically GPS guided, though it can navigate long distances without GPS support thanks to INS (Inertial Navigation System), IBN (Image Based Navigation) and TRN (Terrain Referenced Navigation) systems. Like with Storm Shadow, attack is of climb-and-dive nature, and high-resolution IR camera, used to help navigation, can also be used to help targeting. ALARM is British anti-radiation missile used primarly for SEAD. It is 4,3 meters long, has wing span of 0,72 meters, diameter of 0,244 meters and weights 265 kg at launch. Seeker is wideband RF antenna, which according to Jane’s consists of four antennas forming a fixed two-axis interferometer with lower mid-band to high-band coverage. Seeker is programmed to select highest-value secondary target should primary target go offline. Warhed is a heavy metal (probably Tungsten) casing blast fragmentation device, designed to produce high-velocity fragments which perforate antenna and any supporting electronics. Tail section houses two-stage parachute used for loitering modes, allowing missile to stay in the air for extended periods of time, forcing SAMs in the area to stay off-line. When loitering, missile climbs to altitude of 13 kilometers before activating parachute. Missile homes on to radar’s side lobes, and seeker typically knows type of target it is attacking, allowing warhead to go off at optimum altitude from target. ALARM has five operating modes. First three, used when location of emitter is known, are direct mode, in which missile directly attacks nearest active target; loiter mode, in which missile loiters with parachute above nearest known target, forcing target – and any nearby – to stay offline; dual mode, in which missile flies in attack mode towards designated target, but switches to loiter mode should target go offline. Remaining two, used when location of emitter is not known prior to launch, or when missiles are used against mobile SAMs, are Corridor/Aera supression mode, in which missile climbs steeply from low launch altitude and then coasts in shallow dive, waiting for targets to come on-line. Universal Mode is similar, but is used for high- to medium- -altitude launches, providing better range and larger search pattern. Missile can be programmed on the ground, or just prior to the launch. It is launched directly from the rail, in a similar fashion to Sidewinder, and has range of over 90 kilometers. AGM-88 HARM is US anti-radiation missile which uses dual-thrust rocket motor. It weights 360 kg at launch and has range of over 46 kilometers; seeker is a broadband spiral antenna. Once launched, it can operate in one of three modes: preemptive, missile-as-sensor and self-protect. In preemptive mode, missile is fired before locking on a target; RWRs can then be used to locate threat radars. Advanced HDAM version has GPS/INS guidance, which can be used to restrict missile to engaging targets in certain area. Further, seeker is able to recognise pulse repetition frequencies of threat radars, allowing it to select a specific radar operating in any single band. Brimstone is UK dual mode radar/laser-guided ground attack missile. It is used against armored targets, and uses millimeter-wave radar for target acquisition, which can be programmed to only activate after passing a certain point, so as to minimise potential for friendly fire. Missile uses dual warhead, with first warhead eliminating reactive armor and primary warhead penetrating main armor of the vehicle. It can be used in both direct and indirect mode; in former, aircraft’s own sensors are used to designate targets. It is a fire-and-forget weapon, and is programmable to adapt to specific mission environments, including ability to find targets within a certain area or to self-destruct if targets cannot be found. Several missiles can be fired in a salvo against multiple targets. Missile weights 48,5 kg with 300 g precursor warhead and 6,2 kg main warhead. It is 1,8 meters long. Radar seeker operates at near-optical wavelengths, theoretically allowing for target recognition. BL-755 cluster bomb is primarly used against armored vehicles, with other vehicles and personnell being a secondary target. It weights 264 kg, has shaped charge HEAT warhead and can produce over 200 000 fragments. Payload consists of 147 bomblets in 7 containers, each containg 7 sections with 3 bomblets each. DWS-90 / BK90 is gliding stand-off cluster bomb (submunitions dispenser). It contains 72 bomblets, and like BL-755 is banned in multiple countries due to submunitions being a threat long after the combat stopped, thus violating Geneva conventions (submunitions released from US cluster bombs during Vietnam war are still killing civillians). It is not yet integrated on Typhoon. AGM-84 Harpoon is anti-ship sea-skimming missile with active radar seeker. It weights 526 kg, with 221 kg warhead, and can reach range of over 124 kilometers, speed of 850 kph and maximum altitude of 910 meters. Length of air-launched Block II Harpoon is 3,84 meters. Guidance system is GPS-aided inertial navigation system. Penguin missile is a littoral anti-ship missile developed by Norway with financial support by US and West Germany. It was first NATO anti-ship missile with IR seeker for terminal guidance (pre-terminal guidance is inertial). Mk 3 version is 370 kg heavy, 3,2 meters long with 120 kg warhead and range of 55 km using solid fuel. It can follow a waypoint flight path. Flyaway cost per aircraft was stated in 2002 to be 60 million Euros per aircraft, or 63 million then-year USD. When corrected for inflation, resultant value would be 80,46 million USD in 2012 USD. However, current unit flyaway cost seems to be between 100 and 125 million USD, depending on version. Unit procurement cost is 144 to 199 million USD, depending on Tranche. Jane’s has stated that operating cost per hour is 18 000 USD. This, while higher than Rafale’s 16 500 USD, is identical to F-18s cost of 18 000 USD per hour and lower than F-15s 30 000 USD per hour or F-35s likely 48 800 USD per hour. Eurofighter Typhoon is a highly maneuverable fighter, with low wing loading and high thrust-to-weight ratios, as well as good weapons and cockpit visibility. Its usage of revolver cannon and external missile carriage allow pilot to exploit fleeting firing opportunities whereas good rearward visibility allows him to avoid being ambushed from the rear. However, its fuel fraction is too low for combat-useful supercruising performance, and it is heavier than Rafale or Gripen, which does hurt its maneuvering performance. There is also rather large tactical deadweight in the nose. Typhoon definetly isn’t cheap fighter; with flyaway cost above 100 million USD and maintenance cost per flight hour of 18 000 USD it is most expensive modern fighter aircraft in Europe, unless F-35 (which is actually a ground attack aircraft, and is not yet in service) is counted. Thus it is questionable wether it can provide required force presence in case of a major war. Further, it is limited to large, visible and vulnerable concrete runways. This means that it is in danger of both being attacked on the ground, attacked at takeoff/landing or being grounded by destroyed air strip. Maintenance is also more complex than that of SAABs Gripen. Dassault Rafale is Typhoon’s primary competitor. While some hold Rafale to be primarly a bomber and not an air superiority aircraft, that is wrong as Rafale has all characteristics of fighter aircraft: low wing loading, high thrust-to-weight ratio, high structural g load and good cockpit visibility. 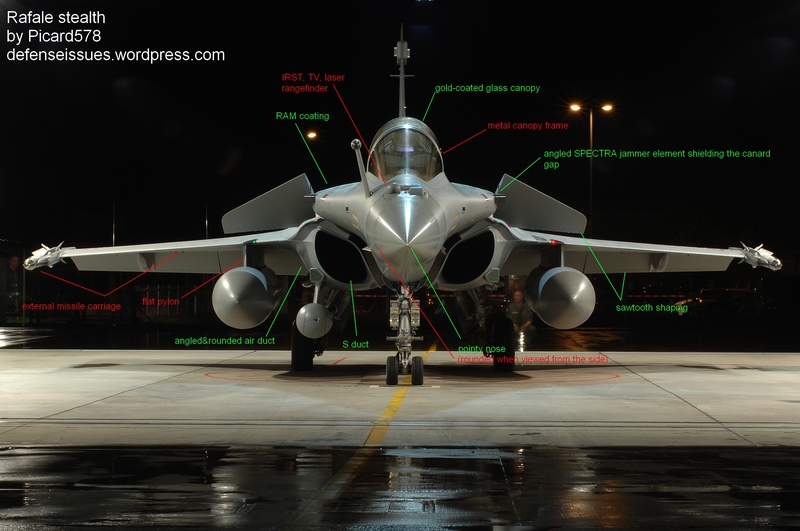 Rafale also has higher fuel fraction than Typhoon, allowing it greater endurance, and higher structural load factor. Other advantages are lower wing loading at 50% fuel and lower drag when turning, provided by cleaner aerodynamics and close-coupled canards. Typhoon does have higher thrust-to-weight ratio, reducing Rafale’s advantage due to lower drag. F-35 is a radar LO strike aircraft, made obvious by its fat shape, bad rearward cockpit visibility, high wing loading and low thrust-to-weight ratio. Its aerodynamics also mean that it has less vortex lift and less body lift avaliable when turning, excaberating the problem and giving it far worse lift-to-drag and lift-to-weight ratios than those of Typhoon. Its internal weapons carriage does give it some drag reduction, which is easily offset by increased weight, complexity and reduced payload. Weapons payload in aerodynamically clean air-to-air configuration is identical, with both fighters having 4 BVRAAMs, but Typhoon’s conformal carriage provides it with faster response time as F-35 has to open doors to fire missiles. Similar situation is with guns: whereas F-35s GAU-22/A has a higher rate of fire, 3 300 rounds per minute when compared to 1 700 for BK-27, weight “thrown” by both guns is 7,4 kg per second for BK-27 and 10,12 kg for GAU-22/A. But while BK-27 reaches full rate of fire within 0,05 seconds, GAU-22/A reaches it 0,4 seconds. Thus even assuming that F-35 pilot opened gun doors beforehand, BK-27 would have fired 13 rounds weighting 3,38 kg in first half of second, compared to 16 rounds weighting 3,44 kg for GAU-22/A. If pilot did not open gun doors, then GAU-22/A will only start firing in 0,5 seconds, and reach full rate of fire in 0,9 seconds. Where air-to-air is concerned, Typhoon also has advantage in sensors department; while F-35s IRST is only optimized for ground targets, Typhoon’s PIRATE’s position and wavelengths are optimised for air-to-air combat. F-35 itself has huge IR signature thanks to its fat shape and a powerful engine which has 7% more thrust than Typhoon’s two engines combined, yet has almost no IR reduction measures. As can be seen, Typhoon is a very capable aircraft. However, it is also costly and cannot provide very large battlefield presence. Thus, it should be complemented by the cheaper aircraft, such as Saab Gripen A/C or F-16A, albeit aircraft in question should be equipped with QWIP IRST and DRFM jammers. USAF often touts F-22 as being the best fighter aircraft in the world. Is that really so? What are requirements for a good fighter aircraft? High agility requires good acceleration, good turn rate, low energy loss and quick transients. Good acceleration and low energy loss require high thrust-to-weight ratio and low drag; good turn rate requires low wing loading, and quick transients require both. Energy state is important for gaining positional advantage and evading missiles. Superior situational awareness requires not only having good situational awareness yourself, but denying it to the opponent. These requirements can only be met through use of passive sensors. Low cost and high sortie rate are required for establishing a crucial numerical superiority over the opponent. Both are achieved by making the design as simple as possible. Capability to convert any split-second opportunity to the kill is crucial in the dogfight, especially if multiple aircraft are involved on both sides, as it allows pilot to deny opponent the opportunity to reverse positional advantage, and allows him to kill more targets in the same timeframe. With standard loadout of 50% fuel, 2 Sidewinder, 4 AMRAAM, F-22 has wing loading of 313,5 kg/m2 and thrust-to-weight ratio of 1,29. For comparision, with same loadout, Eurofighter Typhoon has wing loading of 284 kg/m2 and thrust-to-weight ratio of 1,28; Dassault Rafale’s values are 276 kg/m2 and 1,22. Su-27s values are 324 kg/m2 and 1,24. Thus, F-22 is inferior in wing loading to both Eurocanards, and has only slightly superior thrust-to-weight ratio compared to Typhoon. It is also only slightly superior to the Su-27 in wing loading, and somewhat more in thrust-to-weight ratio. As such, it has slightly better turn rates than Su-27, and worse turn rates than Eurocanards. Its large weight will make it more difficult to F-22 to make transit from one turn to another, and its thrust vectoring will, if used, cause major energy losses. More about that later. As mentioned, superior situational awareness requires not only having good situational awareness yourself, but denying it to the opponent. What this means is that aircraft must be capable of detecting and identifying the enemy completely passively. Currently, IRST and optical sensors are only types of sensors, except for Mk 1 eyeball, to posses such capability. F-22 lacks both, and as such has to either have an uplink to another platform – and such uplink can be detected and jammed – or to carry out both tasks World War II style, with pilot doing detection and identification visually. While F-22 was supposed to have FLIR, it was deleted as the cost-saving measure, and there are no plans to fit it. Moreover, while some measures have been taken to reduce F-22s thermal signature, no major reduction was (or could have been) achieved, especially from the front. F-22 is also very large, increasing its detectability by the IRST. Thus, F-22 will be easily detected at ranges exceeding 80 kilometers by opponent using QWIP IRST. Modern heat-seeking missiles also do not have to rely on engine exhaust for locking on the enemy aircraft, but can rather lock on to aircraft itself. F-22 also isn’t undetectable to the modern radar, despite what some accounts say. While F-22s RCS of 0,0001 and 0,0014 m2 reduces detection range considerably, Typhoon’s radar (which has detection range of 185 km against 1m2 target) can detect it from distance of 18 to 35 kilometers. On the other hand, modern RWRs can detect LPI radars from ranges two or three times greater than such radars can detect target with RCS of 1 m2 at, thus making any use of radar an unwise course of action for F-22 (and any other fighter aircraft). Low cost and high sortie rate are where F-22 feels least at home. Its flyaway cost is 250 million USD per unit, which is twice (205%) the flyaway cost of the most expensive non-VLO fighter aircraft – Eurofighter Typhoon – and has maintenance downtime of 45 hours per hour of flight, compared to the 8* hours for Rafale, 9* for Typhoon, 10 for Gripen and 19 for the now-ancient F-16 (* have to be confirmed). However, flyaway costs of these fighters, which are, respectively, 33%, 49%, 16% and 11-24% of F-22s, mean that it will be at 10:1 numerical disadvantage compared to Typhoon, and 26:1 disadvantage against Gripen. F-22 is also incapable of converting split-second opportunities into kills. Reason for that is the fact that it carries all its armaments internally. It takes around half the second for gun doors to open; for missile bay doors it takes at least that much, and possibly more. Worse, Sidewinders it will be using in visual range dogfight are not simply ejected into air, but have to be lowered by mechanism; however, it is possible that such action will be performed while doors open. Gun itself is the Gattling design. It offers maximum rate of fire of 6 600 rpm (110 rps), compared to 1 700 rpm (28 rps) for BK-27 used in Typhoon and Gripen, and 2 500 rpm (42 rps) for GIAT-30 used in Rafale. However, firing rate alone cannot be used as a measure of effectiveness. First, Gattling gun takes some time to achieve full firing rate. While M-61A2 takes 0,25 seconds to spin up to its full firing rate, fact that F-22 has to open bay doors to fire increases that time to 0,75 seconds. For revolver cannon, time is 0,05 seconds. Thus, in first second, F-22 will have fired either 13 or 68 rounds (depending on wether gun doors were opened before or after press on trigger); Typhoon would have fired 27 rounds in the same time, and Rafale 40 rounds. Second, aircraft now are highly resistant. Thus, per-hit damage and weight fired may be more important than number of projectiles. At projectile weight of 100 g for M-61, 260 g for Typhoon and 244 – 270 g for Rafale, F-22 fares worst in per-hit damage category. For total damage, in first second F-22 will have fired 1,3 to 6,8 kg, Typhoon 7 kg and Rafale 9,8 to 10,8 kg of ammunition. Third, rotation of gun barrels creates vibrations, which means that Gattling design will be less accurate (more spread) than single-barreled designs, and problem will only increase as gun keeps firing. While F-22 is supposed to kill opponent at BVR, it only carries 6 BVR missiles. With usual 0,08 Pk ratio against same-era threats, it will take two F-22s to kill a single enemy aircraft. That is made even worse by the fact that F-22 not only has to radiate in order to lock on the enemy aircraft, but has to get close enough to penetrate any jamming – distance that was regularly around 1/3 of maximum radar range; in F-22s case, it will be 50 – 80 kilometers against 1 m2 target, such as Typhoon or aircraft with comparable frontal RCS (J-10?) in air-to-air configuration. F-22s maximum speed of Mach 1,8 – 2,25 and supercruise speed of Mach 1,5 – 1,7 are better than those of most competitors, as Eurofighter Typhoon – the second-fastest supercruiser – can achieve “only” Mach 1,3 when in combat configuration. Thus, F-22 can choose to run if it finds itself outnumbered too much, but if it does choose to attack, it will most likely be forced to engage the opponent in the visual range. Many say that F-22 is the most maneuverable fighter aircraft by virtue of its thrust vectoring. So, I have decided to take a closer look at various claims about F-22s agility. Some claim that F-22 is the most maneuverable and agile fighter aircraft out there, due to the thrust vectoring. That claim, however, is false. To execute a turn, aircraft requires lift to pull it around the turn. Even civilian jets make sharper turns this way, by banking. Amount of lift can be roughly estimated through wing loading figures, with the caveat that LEX and close-coupled canards do provide the additional lift during high-alpha maneuvers by strengthening vortices created by the wing. However, while F-22 does have LEX, it is not the only one. Dassault Rafale has both LEX and close-coupled canards, Saab Gripen has close-coupled canards, and Eurofighter Typhoon, while not having either, does have vortex generators at sides of the fuselage. Thus, actual lift at high AoA could be estimated by comparing length of forward portion of the wing to the aircraft’s weight. This method is only of limited accuracy, however, it is more accurate than standard wing loading figures for high alpha maneuvers, as large portion of wing stalls in such circumstances. F-22 has combat weight of 24 883 kg and combined wing leading edge length of cca 12,58 meters, which becomes 20,56 meters when LEX and air intake leading surface are taken into account. Thus loading value will be 1210 kg per meter. However, LEX-generated vortices will improve value. Eurofighter Typhoon, on the other hand, has combat weight of 14 483 kg and combined wing leading edge length of ~18,3 meters along with canards. Thus its loading value will be 791 kg per meter, or slightly higher, but as with F-22, vortices will improve value – this time vortices generated by strakes at sides of Typhoon’s hull. Both Typhoon and F-22 have similar wing sweep and high-lift devices, so actual lifting area per meter will be the same, except maybe for canards. At lower angles of attack, when entire wing area is used, F-22 will have wing loading of 319 kg/m2 in standard combat configuration, and Eurofighter Typhoon will have wing loading of 283 kg/m2. Thrust loading ratios will be 1,28 for F-22 and 1,25 for Eurofighter Typhoon. We can thus see that, while F-22 has thrust-to-weight ratio advantage, Eurofighter Typhoon has both lower combat weight and lower wing loading at combat weight, and thus has better maneuvering performance. Dassault Rafale will have similar advantages, although its canards act more like F-22s LEX, which makes it for two aircraft that have better maneuvering performance than F-22. Comparing it to the F-15C, we see two things: wing loading and thrust-to-weight ratio that are very similar, with F-15C having slight advantage. While F-22 is larger and heavier aircraft, it is also unstable, improving its response time and removing resustance of aircraft towards the continued turn. It also has LEX, which improves lift at high angle of attack. While its internal missile carriage adds weight and frontal area, that is cancelled out by reduced drag due to lack of external stores. F-22 and F-16 have two major things in common: both are relaxed-stability designs and both have LEX. As such, similar wing loading figures and thrust-to-weight ratios will result in similar maneuverability, especially since F-16 was designed to achieve optimum performance when two wingtip AAMs are present. With 50% fuel, 2 Sidewinder and 4 AMRAAM F-16C has wing loading of 392 kg/m2, thrust-to-weight ratio of 1,186 and weights 10 936 kg. F-22 has wing loading of 313,5 kg/m2, thrust-to-weight ratio of 1,29 and weights 24 579 kg. Thus, while F-22 will suffer maneuverability penalty due to its size and weight, it is unlikely that F-16C will be able to outmaneuver it. With F-16A it is a different story. With empty weight of 7 076 kg, it has wing loading of 349,5 kg/m2 and thrust-to-weight ratio of 1,29 (figures for 50% fuel and 2 Sidewinder). While its wing loading is higher than F-22s, F-16A is far lighter and smaller, so it is possible that it could be capable of matching the F-22. To conclude, while Pierre Sprey’s notion that F-22 is no more maneuverable than F-15C is not supportable, those that insist F-22 is the most maneuverable fighter aircraft in the world are equally wrong. Indeed, new fighters such as Eurofighter Typhoon or Dassault Rafale will have better maneuvering performance with virtue of their better aerodynamics and superior attributes (wing loading, thrust-to-weight ratio, etc). F-22 also does not meet force size requirements. Some claim that Super Bug is a better solution than F-35 is… some claim that it is not. So I have decided to carry out point-by-point comparision between F-18E and F-35, throwing in Tranche 2 Eurofighter Typhoon and Rafale C as examples of modern Western fighter, as well as possible alternatives. What makes this comparision even more important is the fact that United States, Canada and Australia all have similar operational requirements and as such have very similar requirements for a fighter aircraft – for example, long range, twin engines and reliability. Source for F-35 data is here. Maneuverability is a sum of several factors: lift, thrust, drag, and inertia. Lift, thrust and inertia can be compared through wing loading, thrust-to-weight ratio, and weight; drag can be compared by comparing airframes’ physical size. Turn is executed when aircraft uses control surfaces to change wing’s position relative to the air flow; thus, direction in which lift pulls aircraft is changed, producing excess lift (one not used on keeping aircraft in the air), which then pulls aircraft around the turn. Aircraft with lower wing loading have more excess lift on disposition, and as such can pull faster and tighter turns. Aircraft pulling tighter turn at corner speed has better chance to evade missile fire and can pull inside opponent’s turn diameter. Roll is when aircraft rotates around longitudinal axis. Aircraft with faster roll can transit from one maneuver to another faster. Thrust-to-weight ratio is important for overcoming drag during the turn, allowing aircraft to maintain energy and turn rate for longer time. Drag bleeds off energy, thus reducing time during which turn rate can be maintained. Inertia is a product of weight and speed. When entering or exiting a turn, aircraft has to use lift and thrust to counter inertia. Thus, heavier aircraft are, assuming identical wing loading and thrust loading values, more sluggish in maneuvering combat. G-load is required so that aircraft does not fall apart during the turn. What it means is that, even if (aerodynamically) aircraft could turn faster at certain speed, it is limited by what its structure can take. As we can see from the table, Super Bug is superior in both wing loading and G factor to two out of three F-35 variants. It also has superior thrust-to-weight ratio to all F-35 variants when loaded for air combat, and only F-35A has comparable thrust-to-weight when at 50% fuel. It is, however, slightly heavier than most F-35 variants, which means more inertia and thus worse response time. Eurocanards, meanwhile, are superior to both Super Bug and F-35 in all listed areas. Rafale fares better in wing loading and thrust-to-weight ratio areas than Typhoon does, mainly by virtue of its higher fuel fraction, and its close-coupled canards allow it to achieve highest AoA value of all compared aircraft, which greatly benefits its low-speed agility. Only characteristic where F-35 is superior to Eurocanards is roll rate, mainly due to its shorter wing span. Here, Super Bug is convincingly the worst of the compared aircraft, as it lacks IRST. As such, it has to use its radar to detect the enemy, immediately betraying its location at far longer range than it itself can detect the opponent. All three other aircraft have IRSTs of, apparently, roughly comparable characteristics. Here, Super Bug takes last place again. Rafale has the best range, owing to its good aerodynamics and high fuel fraction. Whereas some F-35 variants have comparable or better fuel fraction, their low speed and large aerodynamic compromises required by stealth mean that range is lowered considerably, and is worse than that for Eurofighter Typhoon, which itself has low fuel fraction. Standard weapons loadout for all listed aircraft is 2 Sidewinders and 2-6 AMRAAM. However, F-35 has no option of carrying more without compromising its already questionable X-band radar stealth, whereas other aircraft don’t go to such legth to achieve LO characteristics, relying instead on other approaches (maneuverability + countermeasures + passive sensors). Thus, F-35 is limited to 4 missiles if it doesn’t want to loose radar stealth, whereas Super Hornet can carry 6, Eurofighter Typhoon 12 and Dassault Rafale 8-10 AtA missiles. In non-LO configuration, F-35 can carry 10 missiles. In bombing missions, F-35 can carry 2 AtA and 2 AtG weapons in LO and 4 AtA and 8 AtG weapons in non-LO configuration. Super Hornet can carry 4 AtA and 7 AtG weapons. Typhoon can carry 7-9 AtG weapons, assuming all stations are cleared for use. Rafale can carry 4 AtA and 5-16 AtG weapons. As F-35 has to rely on LO, its AtA and AtG weapons loadouts are the worst. If LO requirement is ignored, weapons loadout improves considerably, but only to the point of being barely comarable to that of far lighter Eurocanards in AtA configuration; in AtG configuration, assuming one weapon = one pylon, it is the best of compared aircraft, in keeping with its design role of a bomber. As it is obvious, situation is not good for F-35: for a cost of the 12-aircraft squadron, one can buy 19 Typhoons, 28 Rafales, or 39 Super Hornets. All three aircraft, especially Eurocanards, are likely to be less maintenance-intensive than F-35, and can thus generate more sorties per aircraft, thus increasing numerical disparity even more. Per-aircraft, Super Hornet requires 10 maintenance hours per flight hour, Typhoon requires 9 and Rafale 8 (? Typhoon and Rafale figures have to be confirmed), meaning that bought aircraft will generate 85 1-hour sorties per day for Super Hornet, 45 for Typhoon and 74 for Rafale. Aforementioned 12-ship F-35 squadron will most likely be able to generate 7 to 8 1-hour sorties per day. However, Rafales and Typhoons will have better survivability when facing both VHF-radar SAMs and IRST-equipped enemy aircraft than either Super Hornets or F-35s. Neither F-35 or Super Hornet are good choices for Australia; former is too expensive, too maintenance-intensive, too short-ranged and lacking in maneuverability, whereas latter is far cheaper to buy and operate, and easier to maintain, but is also lacking in range and maneuverability. All options considered, Dassault Rafale would be the best choice, followed by the Eurofighter Typhoon. However, with Dassault having secured contract in India, it is questionable wether acquirement schedule for Australia could be accomodated, in which case Typhoon becomes the strategically better choice. Author claims quite a few false things in the article linked above. I’ll counter them one by one. Exercises were 1 on 1 WVR BFM sorties. There was no need for AWACS or AIM-120D, and F-22 had to use radar to try and achieve a lock on Typhoon. Thrust vectoring is effective at speeds below 150 knots and above Mach 1. In entire envelope between these two speeds, TVC-equipped aircraft is no more agile than non-TVC one – and it is precisely there that 90% of air engagements happen. Neither aircraft did or could have used decoys, chaff or flares to “spoof” the missiles as these were completely simulated. Same goes for MAWS. At least some F-22s did use TVC in attempts to get nose on Typhoons and, thus, a simulated missile shots; this left them lacking in energy and thus vulnerable to Typhoons. Single engagements are most representative of individual qualities of the aircraft; as number of aircraft on both sides increases, coordination and quality thereof becomes more and more important. F-22 is inferior to Typhoon in medium- to high- -subsonic and transsonic agility, situational awareness (no IRST), cost, sortie rate, maintenance demands and gun quality. Meteor BVR missile about to be used by Typhoon is shorter-ranged but offers far greater no-escape zone than AIM-120D, thus making it more effective – wether it will turn around dismal performance of BVR missiles remains to be seen. BVR missiles, when used against targets that were similar in numbers and capability to launch platforms, never went above Pk of 10%. It is not prudent to assume that it will change. F-22 weights 24 579 kg with 50% fuel, 2 Sidewinder and 4 AMRAAM, and has 31 751 kgf of thrust on afterburner, giving it TWR of 1,29. In same configuration, Typhoon weights 14 427 kg and has 18 144 kgf of thrust on afterburner, giving it TWR of 1,26. Thus, while F-22 has TWR advantage, it is not as large as author claims, and is not enough to offset its disadvantage in wing loading. Nor will thrust vectoring help it evade missiles, for energy loss is too great and leaves it vulnerable to further attacks even if first missile is evaded. While F-22 has reduced temperture of exhaust – a very useful thing – it did come at cost of performance, and it did nothing to adress the IR signature of aircraft as a whole. While weapons advance over time, so do countermeasures, and new weapons and technologies very quickly cease to give a noticeable advantage. As such, visual-range dogfights being thing of the past is not a reliable assumption. In visual range, F-22 provides neither numerical nor qualitative performance required for securing a victory, or coming close to securing it. F-35, on the other hand, is a sitting duck in a visual range fight, leaving F-22s to fend for themselves once F-16s and F-15s numbers are reduced sufficiently. F-22 is 19 meters long, has a wing span of 13,4 meters and weights almost 20 tons when empty. Closest-sized aircraft it may face one day, Su-35, is 22 meters long, has 15,3 meter-wingspan, but weights little less than 18,5 tons when empty. Versus Typhoon, a smaller aircraft with lower wing loading, F-22 is at disadvantage as it takes longer to transit from one maneuver to another, and cannot turn as tightly as Typhoon can. While F-22’s superior TWR will provide it with slight energy advantage as fight drags on, assuming it does not use thrust vectoring, Typhoon’s lower wing loading, smaller size and superior aerodynamics will make a victory for F-22 far from guaranteed even in a prolonged fight. BVR IFF system is yet to prove reliable, and F-22 has neither advanced IRST or optical suite that may make reliable BVR ID possible. PAK FA, with its wide lifting body, low drag, IRST, and thrust-to-weight ratio only slightly worse than F-22s, will prove a dangerous opponent to F-22, assuming these two aircraft ever go face-to-face – a highly unlikely scenario. PIRATE IRST is IRST sensor used by Eurofighter Typhoon. It is FLIR, which means that it can use IR radiation to assemble a video image, similar to night vision devices and infrared cameras. Against a fighter supercruising without afterburner at Mach 1,7, detection range will be 10% greater, resulting in range of 100 km from front and 165 km from rear. Comparing it to OLS-35, it should be able to detect AMRAAM launch from 173 km, and Mach 4 AMRAAM from 154 km.